you get used to stuff; listening to runrig for a several years will probably inure anyone to either headaches or dandruff (just kidding). similarly, riding the highways and byeways of the principality for well over 25 years, having experienced every wind direction it is possible to endure and having innocuously gathered the skill of handling galeforce crosswinds, brings me to the point where i really don't think as much about cycling in the wind as do others. having lived adjacent to an international airport throughout the majority of my childhood, on reaching the cloistered corridors of art college, a building not too far from the flight path of aberdeen airport, for a while, i seemed to be the only one who didn't notice aeroplanes flying overhead. and while on my way to debbie's last friday afternoon, i was joined by a visiting cyclist who complimented me on the joys of cycling on islay, but commented on the ever present wind. something of a common situation amongst non-local cyclists, i was eager to point out that, on friday, we were only experiencing a strong breeze and that if he would care to return in december or january, we'd be more than happy to show him islay when it was windy. yes, you are correct; that statement smacks of arrogance and condescension, but in reality, unless the atlantic gusts are in danger of separating rider from bicycle, members of the velo club are not in the habit of commenting. there is an omnipresent wind over here. several years ago, i kept notional records of the daily windspeed at noon; averaging those numbers over the course of a year gave a windspeed midway between 28 - 29mph. that's just the way it is and in common with listening to runrig's recorded output, you get used to it. either that, or you find another hobby that preferably takes place indoors. 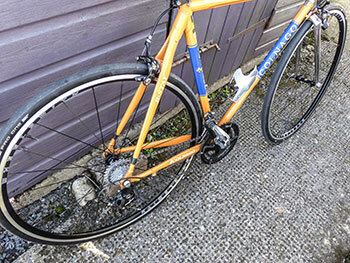 my early days of riding the colnago master fitted with wheelsmith's ascent tubeless-ready wheelset and shod with a pair of schwalbe pro-one tubeless tyres were fraught with concerns over what, for me at least, was a grand step into the unknown. having fitted the tyres myself, i was more than well aware that they remained on the wheelsmith rims courtesy of air pressure. what would happen if that air pressure decided it needed to be elsewhere at any given moment? yes, i carried spare inner tubes to which i could easily resort, but would rapid deflation result in the tyre heading in a different direction than yours truly? the contradictory part of the equation was what i had agreed with myself would be the nature of the reviewing process. i chose to ride those roads that are only brought out for special occasions, roads that could really give a pair of wheels and tyres a hard time. rather obviously, i fervently hoped that the two components would remain best friends with each other, despite my best efforts to induce the opposite. but given that these are not the main arteries of islay life and any mechanical malfeasance would take place quite some distance from civilisation, should i have carried some form of tyre patch? is such an animal an actual thing? (the answer to that question turns out to be 'yes'). by the second outing, i must admit i was feeling a smidgeon more confident, purely on the basis that things seemed to be going rather swimmingly on the tyre/wheel interface front, but there was still this nagging thought that, so far, everything had gone way too smoothly for a technology that threatened to remainder that which we'd all been using for the last oh so many decades. 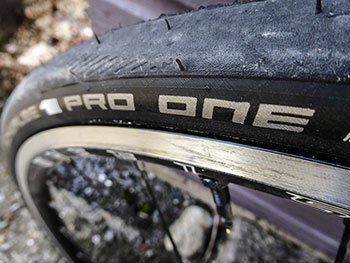 ultimately the whole point of the exercise had been to investigate whether adoption of tubeless wheels and tyres was a valid option and not purely on pristine tarmac, but unless that became the sole aspect of consideration, attempting to do so was never going to work. 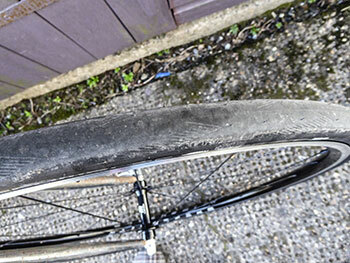 well, we're now several weeks into the tubeless regime and just like my naturally acquired ignorance of the wind, the most recent ride paid scant heed to the nature of the wheels and tyres and almost everything on how they behaved as wheels and tyres. 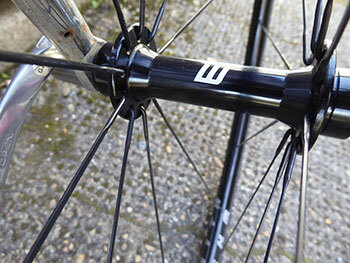 perhaps the most noticeable aspect of running this setup is that of rolling resistance. i have, for once, been paying attention when the road goes downwards and noted that several of my compatriots pedal feverishly on the descent, while lazy me generally takes the opportunity for a rest till we get to the bottom. despite my lethargy, i was scarcely losing any ground to my thrashing companions. it's an observation that has also made itself occasionally known on the flat. if we can assume that this is definitely a demonstration of reduced rolling resistance, i'm quite happy to sign up for that. but the schwalbe tyres are only one half of the equation; a light pair of wheels (1450g) such as the wheelsmith ascents, offer a psychological advantage from the get go, but it's one that becomes reality when the road heads upwards. i'd imagine that's why derek gave them their name. but light rotating weight also confers superior acceleration; it's simple physics: for any given energy input, it will be easier to accelerate a lower mass. where these wheels score most is in their beautifully intangible, hand-built resilience, offering a surety of steering at every speed i'm capable of achieving. but with no drop off in performance even during my laughably unimpressive sprinting, i'm confident that those with greater drive and power output would experience the same at even greater speeds. to a certain extent, the wheelsmiths and the schwalbes have thrust tubeless advancement upon me from a great height. i'm pretty sure my innate conservativeness would have kept me on tyres and tubes until well into my dotage, casting careless aspersions upon tubelessness from a position of ignorance. while many of you will be sniggering loudly at both my temerity and incredulity over matters that have been a part of your velocipedinal lives for many months, i'm sure there are just as many who have erred on the side of 'if it ain't broke, don't fix it' train of thought. if that's the case, the inner tube brigade are still far better served with tyre variations than the tubeless early adopters. the only way that's going to change notably is if more riders opt for the latter. 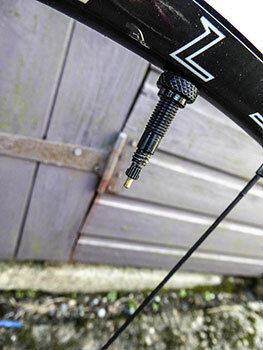 fortunately, tubeless-ready wheelsets such as the ascent from wheelsmith can be fitted with tubeless as well as standard tyres and tubes, so if it doesn't work for you, there's no real expensive damage done. 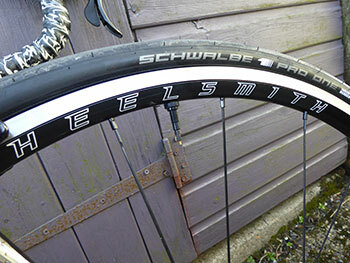 meanwhile, on the basis of my wheelsmith/schwalbe experiment, i'm a happy convert. back in the day, when eddy had sideburns and an allen key to footer with his seatpost clamp, time trials were conducted aboard normal bikes. lugged steel frames with classic drop bars and brake levers with cables sprouting from the top, not forgetting leather saddles with copper rivets. then a bloke called greg stuck a set of extending bars on the front of his classic drops and all heaven broke loose. time trialling has never been the same since. there's no other way to say it: modern-day time-trial bikes are thoroughly ugly looking blighters. vertically straight seat tubes featuring a curve to let the back wheel move closer to the front, brakes cleverly concealed from the wind and heavily flattened tubing in the hope that it might cheat the wind. and of course, there are the ubiquitous tri-bars up front to aid the rider in achieving the flat back position frequently seen in the wind tunnel. since time-trialling depends primarily on momentum, the light weight much desired by the grimpeurs is pretty much ignored, meaning no real need to skimp on the carbon fibre. bicycles such as that described above are engineered to push the rider as far forward as practical, thus the rear portion of the saddle experiences several dozen kilometres of fresh air. but gone are the rivets, the frontmost example of which was the very item that gave rise to the phrase 'on the rivet', back when men were men and rivets were copper. still, tradition must be maintained, whether the rivet actually exists or not. in fact, because the rivet is no longer a tangible entity, the phrase 'on the rivet' now relates solely to the art of riding as hard as possible for as long as possible. and, of course, also to a rather substantially sized tub of chamois cream, the very product that all and sundry claim no longer to use nowadays due to technological advances in the pads built-in to modern bibshorts. i am old enough to have owned and worn bibshorts with real chamois inserts and believe me, chamois cream was a necessity unless you happen to enjoy having your undercarriage sandpapered. so the question remains, is there any need to use chamois cream in the modern world? in truth, i've never stopped using it, no matter the quality of the bibshorts plonked on my saddles, so perhaps i'm the wrong person to ask. but the united kingdom and in particular, the west coast of scotland suffers from a not inconsiderable amount of precipitation, the very substance that might encourage feelings of discomfort down under, discomfort that can be ameliorated by the very cream we've been discussing. 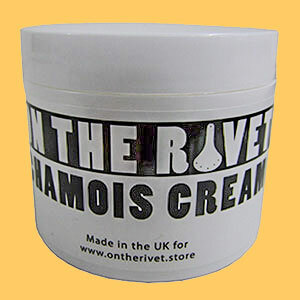 as far as i'm concerned, british made 'on the rivet' chamois cream fulfils its purpose most admirably; discomfort has been refreshingly absent from all the rides undertaken since its arrival at washingmachinepost croft, including a number of rather wet excursions, and at a cost of only £9.99 for a 200ml tub, it's hardly the largest cycling expense you'll incur this year. if you've never used chamois cream at all, perhaps it's time to start. if, like yours truly, you're a long time adherent of the faith, you'll love this stuff. to quote velominati's keeper of the cog, "30km into the ride and you're rollin' smoother than a kitten in a yarn store." on good friday, unlike many of you, i had need of pursuing gainful employment, just because. at the end of a publication week at the newspaper, there are a number of loose ends that require to be taken care of. these predominantly concern pixels and websites along with numerous other associated bits and bobs which, in themselves are quite insignificant, but collectively, they make a notable difference. all this was pretty much taken care of by lunchtime and though there were other jobs to do, i opted once more to play hookie and head off to debbie's for an end of week coffee. as you may well be aware by now, this consists purely of a mere 30km round trip, a distance that at the very least, loosens up tense muscles, in this case, lubricated by a fine cup of froth. as luck would have it, the coffee arrived accompanied by a pancake liberally spread with strawberry jam. sheer indulgence. but this scoffing took place mid-journey in the confines of the coffee shop and not as a punctuation to the bike ride, where food and drink would have been handed from the roadside. the humble musette is one of those essential items that, were it not to exist, would have need of being invented and pretty darned quickly at that. there is good reason why the design has scarcely altered throughout the history of cycle racing and that's because its form and function are pretty much in complete harmony. in other words, it gets the job done efficiently at apparently amenable cost. this might raise an eyebrow or two amongst those who have spent a pound or two on a boutique musette, for surely were professional teams to spend a similar amount on each item, they'd be less than happy when the riders empty the contents into their pockets before throwing it towards eager bystanders. yet though we are keen to make use of these boutique items for our own infrequent carriage purposes, it's very unlikely that you'd throw it in the direction of the sheep on uiskentuie strand when empty. but watch any one-day classic or grand tour and you're unlikely to witness many climbing to a mountain summit still with a full musette about their person. and there's a very good reason for that. the darned thing is a veritable liability when exposed to climbing effort. around once a month i have need of acquiring a 3kg bag of jumbo porridge oats, a purchase generally carried out after the sunday ride when i will not be riding in any other direction other than home. though the route is hardly awash with summit finishes, there are at least a couple of short, sharp hills that engender a few minutes of standing on the pedals. during those brief periods, a musette containing 3kg of porridge oats has a distinct tendency to swing round and impede smooth progress. it's hardly life threatening, but it's certainly a bit of a nuisance. and that is where rapha's excellent packable backpack steps into the frame, for i can only imagine the sniggering from the rest of the peloton were i to undertake the sunday ride with an empty regular backpack across the full distance, not to mention the inconvenience. rapha's packable backpack folds down to the size of one of their leather essentials cases and easily fits in a jersey pocket for those porridge moments that must surely feature large in everyone's velocipedinal life. according to rapha, even in this state, the pack is capable of containing a standard iphone or credit card. yet, when released from its compact and bijou existence, it has the ability to easily swallow a padded jiffy bag containing an oversized a4 folder. 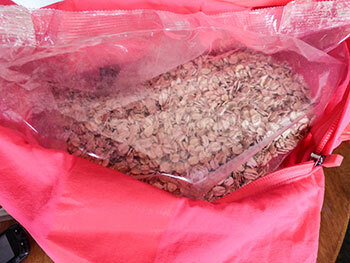 it might even be possible to hold both the folder and its envelope along with the bag of porridge, but i confess, i didn't actually try because several days separated each instance. if the backpack's carrying capabilities are viewed as impressive, the fact that these are achieved within a lightweight fabric that makes toilet paper look overbuilt are even greater. within the backpack when opened out is a separate compartment large enough to hold a sandwich or two or perhaps a spare pair of track mitts. there's a full-width zip across the top to keep everything inside even on vertical downhills and like the edges of rapha's brevet bar pack, the top can be rolled over and fastened in place with a couple of poppered straps. though rapha underline the fact that it is not suitable for carrying extremely heavy weights, there's no specific upper limit mentioned. the sturdy yet flexible straps are both comfortable and effective in use, particularly when time comes to stand up and climb. though doubtless raising one or two eyebrows within the peloton, i indulged in over-exaggerated movement during the climbing process, purely in order to gauge the limits of the adjustable straps. you will be happy to know that the only extraneous movement was from yours truly. though ostensibly forming a part of rapha's city riding range, the packable backpack is versatile enough to span every range offered by imperial works. professional riders may wish to acquire one on the off chance that their directeur sportif has no space left in the team car and needs his ipad carried to the end of the stage, while the bona-fide city rider can doubtless find a myriad of daily instances when one of these would prove essential. whether you need black, navy, chartreuse or pink is entirely down to how comfortable you are with ostentation. each colour features a reflective central stripe on the back. everybody needs one of these at some time in their career. 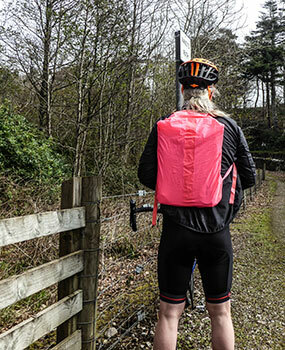 rapha's packable backpack retails at £50. 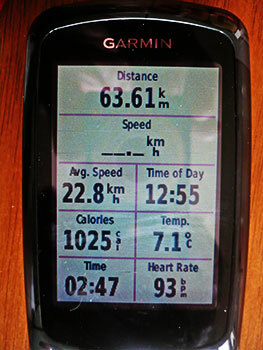 today is referred to in much of the western world as good friday, nomenclature with which i'd be more inclined to agree were i not sat in front of a computer rather than out pedalling my bicycle. or even someone else's bicycle. however, velocipedinal disappointment notwithstanding, easter marks the mental half-way point in my undeniably lackadaisical training regime for the 2017 hot chillee londres-paris ride. you may recall that a few months back, i stated my intention to follow the advice of thomas chapple, author of the velopress publication base building for cyclists. in this comprehensive volume, mr chapple made it plain that, in order to go fast, first one must acquire the ability to tread lightly upon the pedals. at least, that was my take on proceedings, doubtless encouraged by the possibility of not having to cycle until black spots appeared in front of my eyes. whether true or not, it's a training philosophy that appeared to work to my advantage in the years, 2007 and 2008, making it somewhat of a no-brainer to adopt once more some ten years later. the principal difference between then and now was the intervention of a heart-rate monitor, a device i have completely eschewed this time round. the cunning plan had been to restrain my heart-rate below 130bpm from the tail end of 2016 until easter of 2017 after which i fully intended to throw caution to the wind. a bout of conscience, however, inferred that the very use of a heart-rate as part of what i'd prefer not to refer to as my training schedule, would confirm precisely the opposite. and if there's one description i am loath to incorporate into my bicycle riding activities, it's the notion that i might really be training. how can one possibly appear insouciant during communal froth-supping if the conversation were to veer heavily towards discussing varying degrees of performance levels? i'd scarcely be able to hold my head up in public again. however, the question remains as to how i might judge whether i am any closer to achieving my hotly debated goal than i was at the beginning. having gratefully accepted sven thiele's invitation to join him on the road to paris in mid to late july, it would surely be tantamount to bare-faced cheek were i to be seen dropping off the back of the peloton before even reaching the lunch break on day one. oddly enough, despite a complete lack of any visible structure to my saddle-based outings, the average speed does appear to have been creeping ever upwards, albeit in small increments. ever one to take the easy way out, i am encouraged by the latter state of affairs and inclined to carry on as if i have much idea of what i'm doing. unless my speed or stamina starts to take an unexpected downward turn in the next few weeks or so, i think it likely that all will carry on in a similar vein, though i'll continue to credit thomas chapple as the architect of my success. no doubt i am doing a great disservice to the professional coaches and trainers eagerly plying their trade through books, websites and magazine features, because there can be little doubt that any apparent performance improvements are the result of either dumb luck or pig-headed perseverance. this is a perfectly true story, so the names of the participants have been withheld because i can't remember what they are. one sunny, yet breezy friday afternoon, i was sat in debbie's supping froth and quite likely consuming a small piece of lemon drizzle cake when in walked a small assembly of visiting cyclists. after participating in the usual "hail fellow, well met" greetings as practised between civilised velocipedinists, they sat down at the corner table, ordered a round of coffees and cake and proceeded to unfold a large ordnance survey map across the table. as i continued to drain my cup of soya cappuccino, attempting not to look as if i was keen to interject in their topographical proceedings, concerned murmurings and finger pointings took place in the corner. not unexpectedly, after a few more minutes, one of their number turned to face in my direction and enquired if they might ask my advice about an aspect of their future travel plans. always willing to continue islay's reputation for being populated by the friendliest of friendly people, i nodded affirmatively. "we're trying to figure out which would be the better road to choose in order to avoid the wind." i ought probably to have been a tad more circumspect in my reply, but it was too good an opportunity to miss, so i told them i thought they'd be well advised to choose rule #5. as this was in the early days of velominati's existence, the keepers of the rules were few and far between; it was almost a secret society. in answer to their collectively quizzical look, i replied with the unabbreviated version of h.t.f.u. this resulted in raucous laughter and not from yours truly. the velo club, though abiding mostly by rules five and nine, tends to use the former as a weapon of smugness. 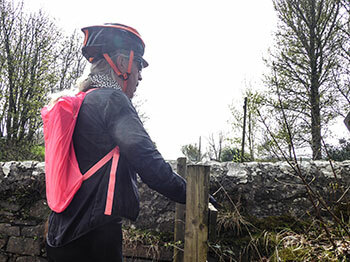 even today, almost midway through april, the hebridean wind would likely give concern to any unsuspecting visiting cyclist. those permanently domiciled in these here parts view such meteorological matters with learned familiarity. in truth, it's pretty much always like this, but more often than not, a lot worse. rather than shy away on a turbo trainer, we're far more likely to go out riding anyway, having recited the rule #5 mantra as the bicycle is extricated from the bikeshed. this consists of a black with red trim, short-sleeve jersey, a matching pair of bibshorts and a pair of appropriately monogrammed socks. 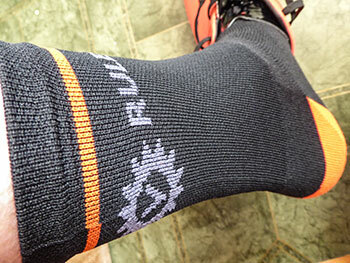 should you for a moment need confirmation of the purpose of dressing thus, 'tis but a minute's attention to view the soles of the socks, the inside of the jersey cuffs or that of the leg grippers where the admonishment to 'harden the f**k up' can be easily read. however, in order not to spook the horses, outwardly the legend rule #5, is the only indication of obedience to the cause. other than the velominati logo, of course. nowadays, it would be simplicity itself to engage the services of a well-meaning custom kit supplier to dye-sublimate some lycra and polyester, before offering it to an adoring, but less than fastidious public. but rouleur magazine has not spent its entire career cultivating an enviable quality of writing and photography to simply throw it all away on some cheap cycling kit. 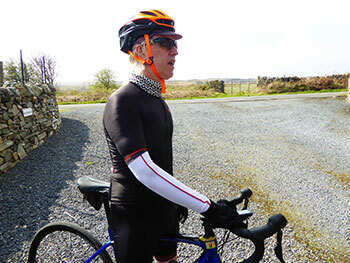 with jersey and bibshorts made in the uk, the rule #5 kit bears very favourable comparison with some of the finest apparel on the market today. i have long contended that the sign of a suitably sized pair of quality bibshorts dictates that they ought to be a tad difficult to pull on; so doing, generally indicates a fit that will prove most amenable, no matter the length of purgatory in which one has decided to indulge on the bicycle. these are those shorts, with bib straps that hold everything in place without incurring red weals on both shoulders when time comes to enter a hot recovery shower. the substantial leg grippers grasp those honed thigh muscles with a tenacity that scarcely ruffles the skin and the pad is reminiscent of the comfort that would compete with a parker-knoll armchair, even if the saddle bears comparison with the legendary razor blade. while praising the tenacity of the leg grippers, it is worth my pointing out that the grippers on the sleeves will fight you for possession of your upper arms. those sleeves will not move a millimetre, no matter the vectors enjoyed by a suspension stem on your specialized roubaix. the rear pockets are more than capable of swallowing a rain jacket whole while accommodating a mini-pump in the selfsame compartment. 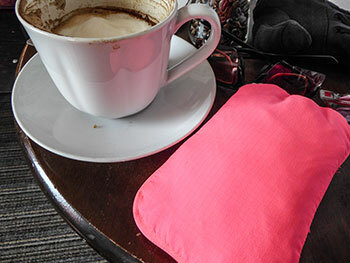 and emergency rucksack, digital camera, coffee money and a spare pair of track mitts are mere bagatelle. 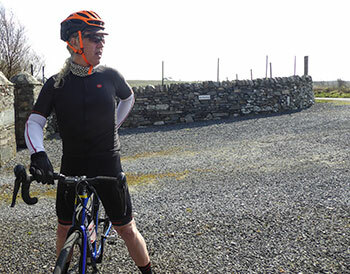 however, due to chilled hebridean temperatures, i accessorised with a richard sachs logo'd collar and armwarmers. i'm inclined to state that socks, are socks, are socks, but in the interests of ubiquity and sartorial elegance, it behoves you well to do the decent thing and make sure they are of the same ilk as their brethren, particularly in light of their sole-based encouragement. 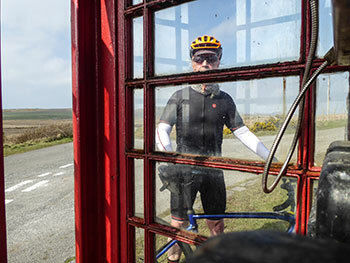 kilometres of riding into the teeth of a near gale-force headwind proved the veracity of each and every centimetre of uk-made polyester and lycra, receiving as hard a time as i was able to give. the fit of the jersey, like that of the shorts, leaves little room for unnecessary bulges to manouevre, portraying an athletic disposition to any innocent bystanders. so enamoured was i by the hidden legend 'neath arms and legs, that i succumbed only to armwarmers, baring a fast-moving, yet naked pair of legs to a chilled atmosphere. rule #5 is an intrinsic part of my dna. however, you may be wondering quite what the earnest adherent to the rules should be seen wearing when the bike is all tucked up for the evening? that is precisely where the rule #5 t-shirt comes in. 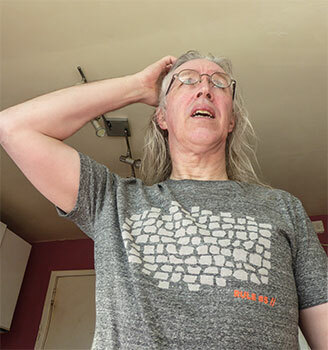 always willing to suffer for your art, i wore this garment for the entire length of eurosport's paris-roubaix coverage, during which it performed every bit as well as any hardened individual could reasonably expect. the complete range of rouleur + velominati rule #5 kit is available direct from rouleur.cc, along with several other exclusive items of roadwear. the jersey, available in sizes ranging from small to xl, retails at £80; the bibshorts (s, m, l, xl) are £20 more at £100, while the simlarly sized t-shirt costs £36 and the socks at £16. the 2017 grand prix season has recently confirmed its continued existence by way of the second event of the season held in china, surely an example of the same globalisation philosophy that currently inhabits the corridors at aigle. though i have no idea who emerged as victor in this motor car race, i cannot help but find a delightful irony in the exhibition of speeding carbon fibre in a country where once there were reputed to be nine million bicycles on the streets of beijing. that is, at least, according to katie mehlua. though i'm sure the sport's legion of fans are well-versed in justifying just how the average formula one machine relates to the corsas and hondas sat in the car parks and driveways of suburbia, it's a relational factor that continues to escape me. on the contrary, despite following a similar mondialisation of the sport, the uci's tight and often heavily restrictive regulatory policy continues to ensure that the bicycles upon which ride our heroes are easily available to world tour fans with deep enough pockets. always taking into account that the speeds at which we are able to ride them, compare disfavourably with the ebb and flow of a professional peloton. however, the apparent availability of top level cycle weaponry should not disguise the fact that it is at that point the similarity ends. the bowmore branch of the velo club may indeed have achieved an average speed of 25kph on the way to debbie's last sunday morn, but that is so many leagues distant from the professionals, that it might as well be on a neighbouring planet. wearing team kit, or a verisimilitude thereof while astride the latest carbon from pinarello or canyon is, more or less, a public statement of affiliation to the cause, not to be mistaken as confirmation of sporting prowess. not, you understand, that i wish to undermine the efforts of several of my strava obsessed colleagues in any way. realisation of this fact, and it should be noted that it is not a universal realisation, will ultimately lead to a greater level of joy when riding a bicycle. 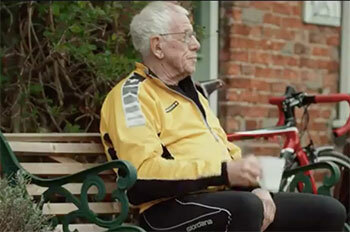 to a greater or lesser degree, this is the message promoted by the latest itv4 advert for this year's tour of yorkshire, an advertisement which stars 85 year-old brian musson, chairman of scarborough's paragon cycling club. riding a fendered dolan road bike, musson rides many sectors of the forthcoming race, including a 16% ascent, while accompanying footage shows the professional peloton covering the same ground with greater alacrity. at the risk of stating the glaringly obvious, mr musson appears to be experiencing greater enjoyment and demonstrably less pressure to perform. "on a bike, there's no finer feeling in the world. when i'm riding a bike in the countryside, i'm happy." i'd like to think that's a widely shared sentiment. "Italy's biggest, most exuberant event happens not in a stadium but on the road..."
when my kids were considerably younger, i took great pleasure in reading them a story before they went to sleep. with my daughter, this created a lasting impression, one that continued through primary school onto secondary and, i'd like to think, played a small part in her becoming a primary school teacher. mind you, i could be wrong about that; i've never asked. my son, on the other hand, though enjoying the same stories with the same level of gusto is, by his own admission, far less of a reader, though with his new found enthusiasm for cycling, he has asked to borrow the occasional book on cycling. narratives such as maurice sendak's 'where the wild things are' and julia donaldson's 'the gruffalo' were consistent favourites, but the crowning glory of my bedtime reading selections was russell hoban's 'how tom beat captain najork and his hired sportsmen', a book that ought at least to be in the running for the most bizarre title in the western world. however, when read in a faux american accent as often featured in private detective movies, tom's predilection for sneedball and fooling around took on a popularity that held no equal. the latter title notwithstanding, i have often wondered whether there are particular books that the younger generation absorb by osmosis. is it possible that children exit the womb, already in possession of at least the bare rudiments of the more popular tales on the lower bookshelves? i'm sure i have observed such rudimentary absorption in one or two of the brighter kids in mrs washingmachinepost's daily care. but then again, i may be guilty of imposing my own beliefs on a society that could care less. but similar traits can surely be observed amongst the velocipedinal cognoscenti when it comes to the more pertinent nuggets of cycling knowledge. though i've scarcely made close examination of my personal recollections, how come i have long held riders such as fausto coppi, gino bartali and franco balmamion in such high regard, yet have not once undertaken a specific course in giro d'italia history? could it be that i have subliminally overheard conversations between members of a more learned peloton? might it be the case that rapha's giro cd of italian music released several years ago, contained relevant informations that would be revealed in the same manner as the legendary 'paul is dead' on playing a copy of the beatles' abbey road backwards? but then again, maybe so. for colin o'brien's giro d'italia, published to coincide with the 100th edition of the italian tour has judiciously and intelligently chosen to reveal specific aspects of the giro's history, inferring some of which remains unsaid and relying on the knowledge that most of us will, apparently, have gained by osmosis. and to be honest, that is its secret weapon. there will doubtless be other dissertations on the event, filled with copious chronological minutiae of learned importance, designed to be commenced at the beginning and read sequentially till the end. o'brien's superbly written (and typographically impressive) history of the pink jersey and the pink newspaper that conceived its existence relies not entirely on chronology to make its case for our attention. "In a manner perfectly fitting for cycling, the Giro d'Italia was inspired by a misture of enmity, chance, cunning and risk. Sport had very little to do with it. Not in the pure, Corinthian sense, anyway, because fundamentally, the Giro was born to sell newspapers." so begins chapter one, following on from a generous introduction forming a brief précis of the previous 99 editions of the race. 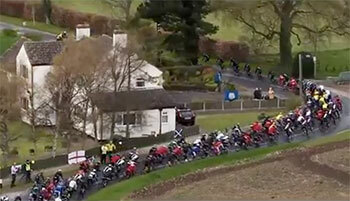 in this, o'brien pays testament to an importance that transcends a peloton of riders headed by a pink clad leader. "On top of creating sporting legends, the race has also become entwined with political and commercial life in Italy." it's a principal factor in the history of the event that those of us more obsessed with carbon fibre, sprints and the stelvio pass are inclined to forget. this particular aspect of the giro's heritage is studiously outlined in chapter 5, entitled 'fascism and the giro'. "Sport, and in particular one that required superhuman endurance [...] was of great interest to Italy's rulers. Mussolini wasn't a great fan of the Giro's pink jersey - unsurprisingly, he thought it effeminate - but the usefulness of its appropriation was obvious." but, though o'brien's narrative even when concerned with political machinations is eminently readable, that is unlikely to be the poster boy that would encourage us to shell out £16.99 for a small, pink, hardback book. aside from legendary tales of derring do across the boot shaped country, our curiousity and desires have need of coppi, bartali, cipollini, tonkov and pantani, to name but a few. in spite of my previous protestations, even osmotic knowledge has need of being well-fed every once in a while. as even o'brien admits "It would be impossible to tell the story of the Giro, of cycling, or of Italian sport in general without discussing perhaps its greatest rivalry." but, as i alluded to earlier, obrien's cunning plan unfolds in the nature of its chapters. where others would perhaps lead the reader gently through history, one step at a time, colin has encapsulated each individual narrative as a series of apparently independent chapters, ultimately portraying the race's history, but like the best jazz, letting us fill in many of the blanks by implication. if, like me, you are an ardent admirer of marco pantani, even with full knowledge of his iniquitous use of banned substances, it is eminently possible to begin reading the book at (ironically enough) chapter 13. this would in no way spoil your enjoyment if you then returned to chapter one. but it's always nice to find some previously unheralded kernel that previous histories or articles may not have featured. o'brien's coup de grace in the final chapter, however, is both pleasantly surprising and arguably, the book's crowning glory. an interview with race director mauro vegni ("originally... a footballer, with little interest in bike racing...") is, to employ a well-worn cliché, worth the price of admission alone. once again, i feel compelled to underline o'brien's intelligent use of prose that encourages the reader to think of this as an enjoyable conversation about bikes, politics and a pink italian newspaper. the story of the world's most beautiful bike race in one of the cycling world's finest books to date. courtesy of pursuit books, i have a copy of colin o'brien's 'giro d'italia to give away to the sender of the first correct answer to the following question: which two italian riders were the subject of a major rivalry in the 1950s?. answers please, along with a full postal address to brian@twmp.net. closing date is tuesday 18 april. 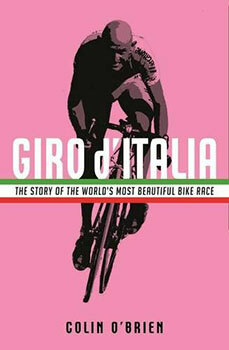 giro d'italia by colin o'brien is published by pursuit books on thursday 13 april.